I never gave much thought to compulsive shopping until I had to deal with it in my own life. Not me personally…I’ve always been pretty budget-conscious, plus I really, really don’t like clutter. However, it might be an easier situation if it was just me! There is a family member who loves to buy things for our us: clothes, home items, etc. You might be think that sounds awesome — free stuff! But that’s the thing, it’s just “stuff” (LOTS of it) and it comes into our house so quickly that it starts to build up before I can find a place for it. New clothes pile up in the laundry room waiting to be washed before their first wear. Photo frames stack on the counter, waiting to be filled. Countless toys get buried in the toy basket and forgotten. A home with two little girls is already a struggle to keep tidy, but with all this extra “stuff,” I start to feel like I’m drowning in shopping bags. This is way for this family member to show love, to “do it better” than perhaps they did for their own children. To compensate for the feeling that they are “not able to be around enough,” even if that is not necessarily true. Additionally, compulsive shopping may be a substitute for other “bad behaviors.” Simple boredom can also play a part. Because there are so many contributing factors (the exact mix could be different for each person), compulsive shopping can be very difficult to get under control. One of my lifelong best friends is in an almost identical situation, so I’m guessing that this type of compulsive shopping for loved ones might actually be quite common. Like other addictive behaviors, it might also be a lifelong struggle to keep it under control. So what can you do to stop the influx of “stuff” and reclaim your space, without hurting the feelings of someone close to you? Set the “new house rules.” Explain that you appreciate their generosity, but that you are clearing the clutter and not able to accept any new items that you don’t need or didn’t ask for. Hold your ground. This might mean you will be turning away shopping bags and sending things back. Boundaries might be tested (though usually not in a malicious way), as the shopper might not think you are serious or might not be able to help themselves. (Coupons, deals, and sales are common excuses for continuing to buy). Suggest other ways to show love or help out. If you’re like me, you might be slightly uncomfortable asking for favors, but in this case, it can give your loved one ways to feel useful without spending money on “stuff.” Ask if they would like to babysit, would they like to take the kids out for a special lunch, etc. It’s important to remember that there likely won’t be an instant fix. In fact, you might have to go through the steps outlined above periodically, as the compulsive shopping can come in waves. Finally, always be compassionate (even when you start to get frustrated). Your loved one probably senses your agitation (I know I’m not always so good at hiding it), they are likely already aware that this is a problem, and it could truly be something they struggle to control. 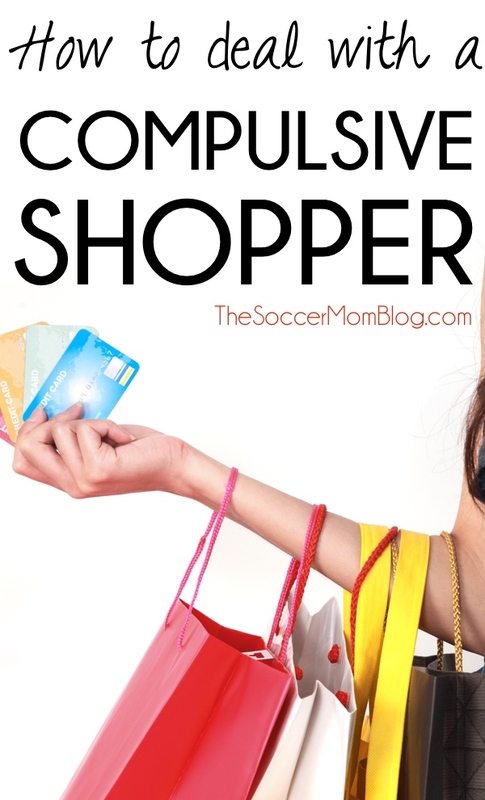 Have you or are you dealing with compulsive shopping in your life? I’d love to hear any other tips you might have that have helped you and your family! I love how you addressed some of the underlying reasons for this type of behavior. I have found (in dealing with my own family member) that expressing gratitude for time spent over gifts is a great way to reinforce what behavior is acceptable in your family. Ex: Thank you for coming to visit us. My children love to spend time with you. That is a great idea- positive reinforcement! I just read this and now realize my husband and I are not the only ones! Thank you so much for writing this!! There are times we have been made to feel ungrateful because we don’t want more items brought into our home. I am now more confident that we are making the right decision for our family. Thank you again. There’s a difference between being ungrateful and allowing yourself to be bombarded with “stuff” 🙂 You’ve got to do what is best for your family. Thanks for reading and letting me know you found the post helpful!